Heat oven to 350°F. In medium bowl, stir together cake mix, oil and eggs until combined and dough forms. Stir in chopped apple. Onto ungreased cookie sheets, drop dough by tablespoonfuls about 2 inches apart. Bake 8 to 10 minutes or until set. Remove cookies from cookie sheets to cooling racks. Cool completely, about 15 minutes. In small microwavable bowl, microwave frosting on High 10 seconds. 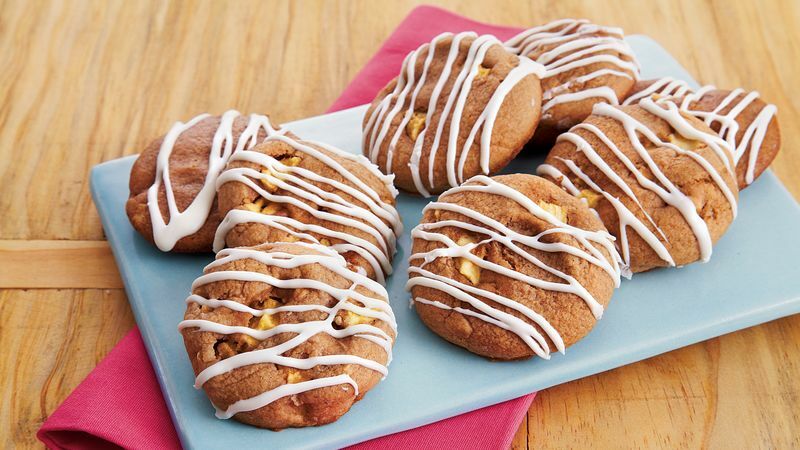 Drizzle melted frosting over cooled cookies. If you don’t want the chunks of apple, use shredded apple instead. If you have a white or yellow cake mix on hand, you can use it and add some ground cinnamon, nutmeg and allspice. Or a bit of pumpkin pie spice.